There is no cross-reactivity with SOD2,3 and 4 by WB. 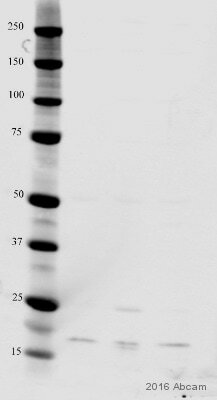 Recombinant full length protein corresponding to Human Superoxide Dismutase 1. WB: Mouse brain and mouse liver tissue lysates, HeLa, 293T and Jurkat cell lysates. IHC-P: Human placenta tissue. Our Abpromise guarantee covers the use of ab16831 in the following tested applications. WB 1/2000. Predicted molecular weight: 17 kDa. IP Use a concentration of 1 µg/ml. Defects in SOD1 are the cause of amyotrophic lateral sclerosis type 1 (ALS1) [MIM:105400]. ALS1 is a familial form of amyotrophic lateral sclerosis, a neurodegenerative disorder affecting upper and lower motor neurons and resulting in fatal paralysis. Sensory abnormalities are absent. Death usually occurs within 2 to 5 years. The etiology of amyotrophic lateral sclerosis is likely to be multifactorial, involving both genetic and environmental factors. The disease is inherited in 5-10% of cases leading to familial forms. Belongs to the Cu-Zn superoxide dismutase family. Unlike wild-type protein, the pathogenic variants ALS1 Arg-38, Arg-47, Arg-86 and Ala-94 are polyubiquitinated by RNF19A leading to their proteasomal degradation. The pathogenic variants ALS1 Arg-86 and Ala-94 are ubiquitinated by MARCH5 leading to their proteasomal degradation. The ditryptophan cross-link at Trp-33 is reponsible for the non-disulfide-linked homodimerization. Such modification might only occur in extreme conditions and additional experimental evidence is required. Cytoplasm. The pathogenic variants ALS1 Arg-86 and Ala-94 gradually aggregates and accumulates in mitochondria. ab16831 staining human normal placenta tissue. Staining is localised to cytoplasm. Sections were stained using an automated system DAKO Autostainer Plus , at room temperature. Sections were rehydrated and antigen retrieved with the Dako 3-in-1 AR buffer EDTA pH 9.0 in a DAKO PT Link. Slides were peroxidase blocked in 3% H2O2 in methanol for 10 minutes. They were then blocked with Dako Protein block for 10 minutes (containing casein 0.25% in PBS) then incubated with primary antibody for 20 minutes and detected with Dako Envision Flex amplification kit for 30 minutes. Colorimetric detection was completed with diaminobenzidine for 5 minutes. Slides were counterstained with Haematoxylin and coverslipped under DePeX. Please note that for manual staining we recommend to optimize the primary antibody concentration and incubation time (overnight incubation), and amplification may be required. 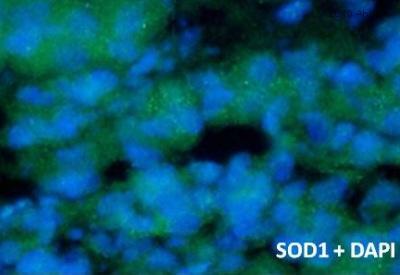 ab16831 staining Superoxide Dismutase 1 in rat bone marrow cells by ICC/IF (Immunocytochemistry/immunofluorescence). Cells were fixed with methanol and blocked with 2% BSA for 2 hours at 25°C. Samples were incubated with the primary antibody (1/250 in PBS) for 12 hours at 4°C. An Alexa Fluor® 488-conjugated goat anti-rabbit IgG polyclonal (1/500) was used as the secondary antibody. DAPI used to stain the nucleus. ab16831 staining superoxide dismutase in mouse liver tissue by immunohistochemistry (frozen sections). Cells were formaldehyde fixed and permeabilized in 0.2% Triton X-100 prior to blocking in 2% BSA for 10 minutes at 21°C. The primary antibody was diluted 1/200 and incubated with the sample for 9 hours at 4°C. Alexa fluor® 488 goat polyclonal to rabbit Ig, diluted 1/200, was used as the secondary. This image is courtesy of an Abreview submitted by Sandra Sobocanec on 16 March 2006. Publishing research using ab16831? Please let us know so that we can cite the reference in this datasheet. etwas im Stress, da ich am Montag meine Masterarbeit abgeben muss. mutiertes humanes SOD1 Protein expremieren. das selbe wissen und mit welchem Maus Protein der Antikörper reagiert. Ich kann bestätigen, dass die Immunogensequenz von ab52950die Mutation G93A nicht beinhaltet und somit beide Proteine erkennen wird. (Ich nehme hierbei an, dass G93A eine Punktmutation ist, die nicht zu einem trunkierten Protein führt). ab16831 ist ein polyklonaler Antikörper, dessen Immunogen das Protein voller Länge war, und es ist somit höchst wahrscheinlich, dass auch er beide Formen, mutiert und WT, erkennt. Dies ist aber nicht experimentell von uns getestet worden. I hoffe, diese Information ist hilfreich und wünsche Ihnen viel Erfolg mit Ihrer Masterarbeit.